The woman who faked her pregnancy and attacked a pregnant Longmont woman, cutting the unborn baby from her womb, has been found guilty of attempted first-degree murder. The jury announced they had reached a verdict at about 10 a.m. Tuesday. The group deliberated for about six hours Monday and then reconvened at 9 a.m. on Tuesday. Dynel Lane was charged with attempted first-degree murder, two counts of first-degree assault, two counts of second-degree assault and unlawful termination of a pregnancy. The jury found her guilty on all counts. Lane attorneys look more distraught than she does. DA asks that Dynel be held without bond. Judge gives parties 14 days to brief her on psychological testing. Sentencing has been scheduled for April 29 at 2 p.m.
Lane faces 16 to 120 years in prison. Minutes after the verdict was read, victim Michelle Wilkins spoke to the media. "I do not hate Dynel. But I am angry for all the pain she has caused. The deceit and all her selfishness," said Wilkins. "Resolution doesn’t end with the case. There is still a lot of personal healing to do," Wilkins continued. Wilkins said every message and prayer has been a comfort to her. Lane wasn't charged with murder in the death of the baby. Colorado lawmakers have rejected proposals to make the violent death of a fetus a homicide for fear such a law would be used to restrict abortions. Lane admitted cutting the unborn baby out of Michelle Wilkins' womb, but told police Wilkins attacked her and she fought back in self defense. Lane said she was afraid she had killed Wilkins during the struggle and removed the baby in an attempt to save it. Defense attorneys asked the jury to find Lane guilty of attempted manslaughter instead of attempted first-degree murder. Lane is a former nurse's aide. During the trial, a doctor admitted that the cut used to extract the baby from Wilkins was "a pretty decent Cesarean." Prosecutors said Lane lured a pregnant woman to her home with a Craigslist ad for maternity clothes. Wilkins was seven months pregnant when she saw the ad and went to Lane's house on March 18, 2015. The district attorney says Lane hit Wilkins over the head with a lava lamp and stabbed Wilkins in the neck with the broken glass. Lane then cut Wilkins' abdomen, took the unborn baby and left Wilkins for dead, prosecutors say. The baby, later named Aurora, never survived outside the womb, investigators determined. On the first day of the trial, Wilkins testified and described the excruciating horror she experienced. "After she broke the bottle over my head and stabbed me and she was trying to choke me... I remember thinking of Aurora and feeling like... I just thought of her and I wanted to survive... for her. So I fought back harder," Wilkins said. Thursday's testimony focused on the doctors at Longmont United Hospital, and highlight how the suspect and the victim were treated in the same hospital at the same time, both without knowing it. "[Lane] told me that she was at home and a pregnant woman had come to her house to purchase some baby clothes. And that while she was there, Michelle had, for some reason, attacked Dynel with a knife," Dr. Brian Nelson, OBGYN testified. Lane also said Wilkins had started stabbing herself, Dr. Nelson said. "Dynel was concerned about the welfare of the baby," Nelson testified. "Dynel felt she had to save the baby's life and therefore cut the baby out of [Wilkins]." Nelson also treated Wilkins and described her injuries. "There was a large laceration across her abdomen," Nelson said. "Her small intestines were out of her abdomen and she was kind of holding them in her hands." On the third day of the the trial, Lane's taped interview with detectives was played for jurors. Lane told detectives she and Wilkins were looking at baby clothes in the basement when Wilkins suddenly attacked her. "Before I knew it, she had, I think, it was a knife that I had opened my box with, and it was sitting on the counter... she came at me and I just kind of reacted. We ended up in my daughter's room and she kept trying to hit me. I asked her, 'What are you doing?' I'm like, 'Stop!' I didn't have my phone with me so I felt completely... I don't even know after that. And then, I was just defending myself," Lane told police. "I strangled her because she wouldn't stop," Lane said, crying. "What were you thinking about with the baby?" the detective asked. "I thought I killed her and I didn't want the baby to die, too," Lane continued. "I had the knife that she had. And I tried to get the baby out." The prosecution and the defense gave their closing arguments Monday morning after Boulder District Judge Maria Berkenkotter read instructions to the jury. The prosecution said Lane's decision to act was not hasty or impulsive, which is what Lane's defense attorneys have argued. "She said she was having a boy and she decided to name it James," prosecutors said. "She even had a baby shower with her family in the fall of 2013." 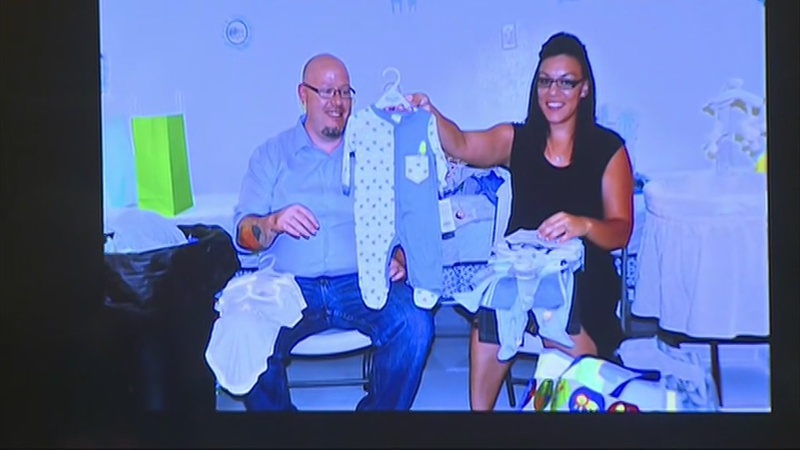 The defense said that Lane claiming she was going to have a baby boy and then attacking a woman who was pregnant with a baby girl proves that she acted without planning. "If you're going through all that trouble, don't you think if it's your intent to cut someone's baby out, that you're going to take some time to find a woman pregnant with a baby boy?" the defense asked. "Logic tells you, at least, to do that." Lane's attorney argued that the jury should convict Lane of attempted manslaughter, not attempted murder. Boulder County District Attorney Stan Garnett told jurors to use common sense in reaching a verdict. "Actions speak louder than words," Garnett said.